Jan. 14, 2015 9:00 a.m. This month a new festival — the Kootenay Fatbike Festival — will be held in Rossland and what better time to celebrate fat tire bikes than during the Winter Carnival. The three day Fatbike Festival begins on Friday Jan. 30. Ian Craib, a Rossland property owner and bike fanatic, conceived the concept of the Fatbike Festival in Rossland, for the sport that is taking off around the world, to demonstrate the equipment’s potential to people of the Kootenays especially during the winter months. “A year ago I had the opportunity to ride a fatbike. My wife and I were staying at a lodge for five days and were planning on skiing. The fatbike was brought along to try out if time permitted. In the end, I enjoyed it so much I spent four out of five days riding the bike around,” Craib said. Craib revels in the sport so much that he wanted to share it with the people of Rossland and the surrounding Kootenay region. Craib approached Tourism Rossland and Red Mountain Resort along with the region’s bike shops to bring the festival idea to fruition. The first day of the Fatbike Festival promises to be a lot of fun with a group ride in the carnival parade followed by a group ride and a visit to a local pub. For those who have never ridden a fatbike, or just can’t get enough of them, then day two gives people the opportunity to demo one of these bikes at Red Mountain Resort from 10 a.m. until 2 p.m. On day three there will be an endurance race on the fat tire bikes. Those wishing to participate in the endurance ride should contact Revolution Cycles to register. Craib says fat tire bikes have a lot of potential to bring new cliental to the region as participants in the winter sport. The Kootenays with its trail systems and ski areas is perfect for the sport. 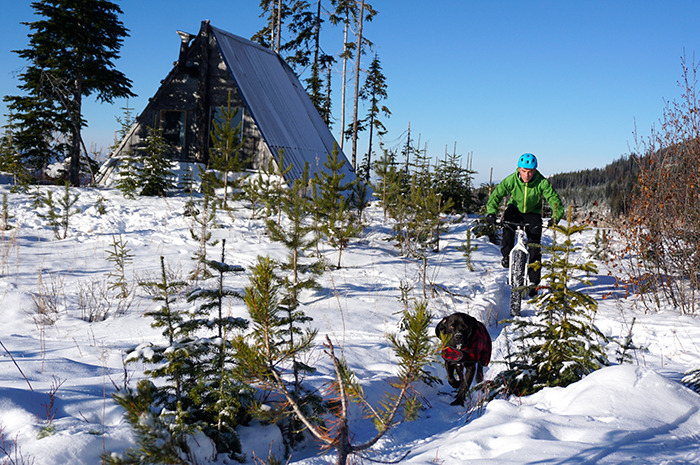 “I hope to introduce the sport of fatbiking as a winter sport and eventually see the places like Red Mountain and the cross country ski clubs (Black Jack) integrate the sport with their facilities,” he said. The bikes with extra wide tires are purpose built for the winter as they handle well in the snow and can be used across a range of terrain from trails to downhill and on the road. The festival is still looking for volunteers, especially to help set up the course for the endurance ride. If you would like to lend a hand contact Ian Craib 250-882-1703 or ian@oakbaybikes.com. For more information about the festival visit www.facebook.com/kootenayfabike.